A book that reads for it's story, it's style and it's type. 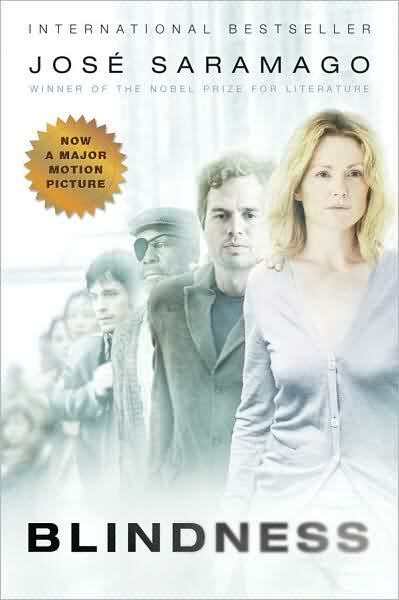 The second I picked it up, Blindness by Saramago became a page turner. The story is simple. An epidemic hits a community: people become blind and they are contagious. The pace of the story telling is very quick despite the numerous details and the often repetitive actions that offer the reader power of predictability. Saramago manages to make the dialogue flow, actually facilitating the reading. There is a reason why the writer has chosen to write uninterrupted text, with little or no paragraphing. He intends for a faster pace, uninterrupted reading. He sets the tempo of the reading. Many of his words (I read him in French translation, he writes in Portuguese) are erudite and very precise. I have encountered a multiple of words synonymous with "to see". He uses them with irony. Sight is the main theme of the book. A friend of mine described the style as "graphic", which is quite ironic given that it is about blindness! I must compare this book to another one: The Road by McCarthy. Both are apocalyptic: humanity suffering through something inexplicable that will shake human existence, rendering daily routine impossible. Neither writer tells us where and when it happens. The one thing I did notice in Blindness is the use of land lines for telephones (no mobiles or internet mentioned) so it should be set before the 1990s. However, time and place don't matter. Both authors write a universal timeless story. In both books, neither the characters nor the readers have a concept of time. Night follows day and we all loose count like a prisoner without the means of drawing sticks to keep count. Indeed, the books have such a strong effect on the reader that they leave us constantly thinking and wondering. In fact, I still find myself puzzled by The Road six months later. In both cases, my husband and I had our own private book club, reading simultaneously and discussing the books. He made a very good point about the political images in the book, comparing the internment of the blind to the imprisonment at Guantanamo: unjustifiable under the pretext of national security. I found myself telling my son in detail what was happening in Blindness, two chapters at a time, reminding me where I left the story the day before. He listens attentively because the narrative is captivating and he made me promise to tell him more as I read further. Almost like a TV serial. He always asks: "What happened to the wife of the doctor, the one that wasn't blind? Is she blind now?" He was able to pick her out only through my story telling. As I read, I too kept wondering about the wife who joined the Blind people in solidarity and for love of her husband, lying and pretending she was blind too. Why didn't she catch the virus and when will she catch it? My son also asked: "mama, do you think they will regain their sight?" I think that is the obvious question to all readers. We read on to find out. In both the Road and Blindness the human condition, when under very tough conditions, resort to reflexes of survival. Literature often depicts human nature as ruthless and selfish, instinctively ferocious. In the Road, a father and son roam through a devastated and frozen land (with the menace of encountering dangerous men). In Blindness, men, women and children live in captivity with no eye sight, and the issue of cohabitation becomes the issue. I thought of the impact of these two novels on their readers. A bit like the reception of George Orwell's 1984. It had a ripple effect. The Road and Blindness are inheritors. Both novels are disturbing, only the Road is endearing. "I don't think we did go blind, I think we are blind, Blind but seeing, Blind people who can see, but do not see. " Although my son's desperate questions do get answered in Saramago's work by the end of the novel, a dozen of other questions assault you. And that is what makes a novel powerful. Tough blog today,even for Sunday reading!It reminds me of being force-fed reading Le Monde which I subscribe to during summer,and pile it up for my daughter to read stale. I prefer light reading in summer,that is why Im finishing Dan Brown's silly book the Symbol.I advice that you watch the movie instead of reading the cinematic script. Why would anyone want to read about Blindness in summer?Surrounded by the magnificent colors of the Mediterranean Sea,I prefer to appreciate nature's beauty and cozy up with Orhan Pamuk's latest book the Museum of Innocence!